Your wedding is one of the most important moments of your life and throughout the process of planning your big day, being sure that your every wish and detail will be catered for is of the utmost importance. Having your wedding in Scotland offers you more freedom than in many other locations as the laws around marriage are far less restrictive, allowing you to plan your wedding away from a traditional service if you wish. 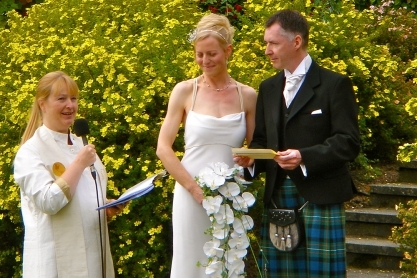 See options for Scottish wedding ceremonies. In Scotland, there is no legal obligation to be married in a church; you can marry anywhere you like. Hence, in Victorian times, the trains would run up to Gretna Green where eloping, 'unsuitable' lovers would sneak off to be married without interference from parents. If you are not religious, this gives you the freedom to marry in wherever you like, from castles to highland moors or loch shores. With so much beautiful scenery at your disposal in Scotland, it would be a pity not to make the most of it and ensure that your big day is a truly memorable occasion. Scotland's liberal weddings laws also mean that if you are gay or lesbian and wish to have a civil partnership then Scotland is one of the easiest places to do so. Under Scottish law, all gay and lesbian couples have a legal right to a civil partnership. So, whatever your sexuality, you too can plan your big day safe in the knowledge that discrimination or any other unsavoury hassles will not blight your plans. Interfaith ministry is a popular choice for couples who want to tailor their marriage ceremony to their particular desires and beliefs. Interfaith ministers in Scotland offer a wide range of wedding services for couples to plan their wedding exactly where and how they want it, again, as interfaith weddings can take place anywhere, the choice of location is entirely up to you.